Xiaomi which launched their first Tablet device in India on a launch event on March 12th the Mi Pad will be going on Open sale on March 30th on the E-commerce site Flipkart. Unlike other Xiaomi devices where it was required to get invites and was sold through flash sales. The device was launched in china last year in 2014 which was a huge success and with the recent flash sales it is a similar case in India as well with the devices being sold out in just a few seconds. Coming to the specs and features of Mi Pad it comes with a 7.9 inch IPS LCD display with LED backlit display which is seen in most of the Computed screens these days with 20148 x 1536 pixels resolution. It is powered by a 2.2 GHz NIVIDIA Tegra K1 quad-core processor which is supported by 2GB of RAM. It is further coupled by a NVIDIA GeForce GPU with 192-core CUDA cores. The tablet device by Xiaomi comes with 16GB of internal memory which can be further expanded upto 128GB using microSD card support. Coming to the camera aspect the device is equipped with a 8MP rear or primary camera which comes with Back side illumination and the front camera is a 5MP shooter fit for good selfies. The device is powered by a 6700 mAh battery which is pretty good for the tablet giving it good battery life the official specs are yet to be seen. 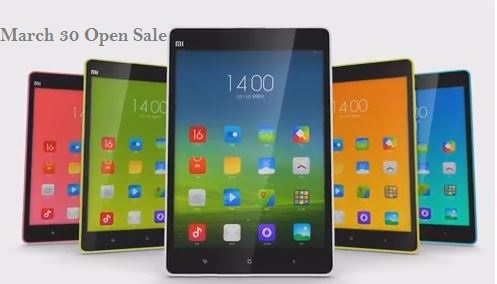 Coming to the pricing and availability of Xiaomi Mi Pad in India through Flipkart, it was sold on March 24th along with the Redmi 2 and now it is coming back on open sale on March 30th through Flipkart where no registration is required and no need to participate in flash sales to buy Mi Pad. It is priced at Rs. 12999 INR.